In previous client alerts, we had warned against the U.S. Department of Labor’s increasingly aggressive stance on subjecting independent contractors to federal labor laws, and melding one or more businesses together as “joint employers.” With the confirmation of Secretary of Labor, Alexander Acosta, that stance has abruptly changed. While both Interpretations are now withdrawn and therefore of no effect, the DOL was careful to caution: “Removal of the administrator interpretations does not change the legal responsibilities of employers under the Fair Labor Standards Act and the Migrant and Seasonal Agricultural Worker Protection Act, as reflected in the department’s long-standing regulations and case law.” The withdrawal signals a more tempered enforcement position than what existed under former Secretary Tom Perez. As a practical matter, this means employers can have a little less anxiety about the DOL showing up for a surprise audit and deeming all contractors employees or deeming the employer a joint employer with related businesses. With that being said, employers should, of course, continue to follow existing laws and regulations unless and until they are formally changed. One such regulation we continue to monitor closely is the 2016 “overtime rule” increasing the minimum salary for exempt employees from $455 per week to $913. As previously reported, that regulation was blocked by the Fifth Circuit Court of Appeals, but we are still waiting for final resolution of that appeal. Secretary Acosta is expected to propose a new regulation, potentially more in line with inflation from 2004, when the rule was last updated (which would be about $635 per week). 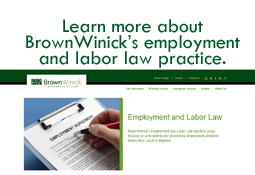 For any questions about classifying employees vs. independent contractor, potential joint-employer situations, or overtime, contact a member of the BrownWinick Employment Practice Group.